D. Foskett, John Smart. The Man and his Miniatures (London, 1964) p.65, 78. Samuel Pitchford was the nephew of the celebrated Vice-Admiral Sir Samuel Cornish, 1st Baronet of Sharnbrook (c.1715-70). Following his uncle’s death in 1770, Pitchford assumed the surname Cornish and inherited his uncle’s estates of Sharnbrook, Tofte and Temple Hills in Berkshire, the baronetcy however became extinct. In 1761 Cornish was appointed Captain, however, records of his activities in these early years remain elusive. In 1778 he was commanding officer on the ninety-gun ship London and the following year, when serving on Invincible, was present at the capture of the Caracas Convoy and at the Battle of Cape St. Vincent. In 1781 Cornish was commanding officer on the Arrogant and saw action at the Battle of the Saintes in April 1782. In 1790 Cornish was serving on the Marlborough and three months later was promoted to Rear-Admiral of the Blue. Cornish’s promotions thereafter were in relatively quick succession, no doubt a reflection of the increased demands on the Navy during the French Revolutionary and Napoleonic Wars. In 1793 Cornish was promoted to Rear-Admiral of the Red and again in 1794 to Vice-Admiral of the Blue. Later that year he was made Vice-Admiral of the White and the following year Vice-Admiral of the Red. Four years later in 1799 Cornish was appointed Admiral of the Blue, two years later he was made Admiral of the White and finally in 1805, Admiral of the Red. Cornish died in 1815. The inscription on the reverse work indicates that this likeness must have been taken whilst Cornish was still a captain, but after he had assumed his uncle’s surname following his death in 1770. 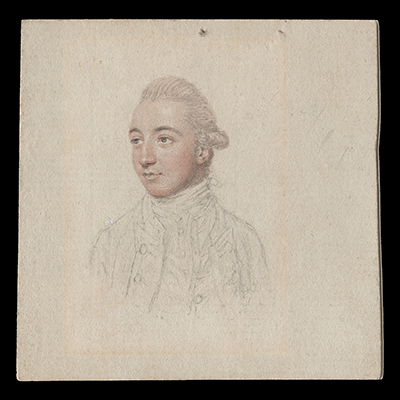 His relatively youthful appearance suggests this work was painted in the early 1770s when the sitter would have been in his early thirties. Intriguingly, Cornish was also painted in oils by Tilly Kettle (1735-86), who was the first professional British portraitist to forge a career in India. Kettle arrived in India in 1769 and travelled between Madras, Calcutta and Fyzabad before returning to London in 1776.